The countdown to the 2012 Summer Olympic Games is on. And about a month before athletes from around the world compete for Olympic Gold in London, another series of games will test a different kind of athlete. Top maintenance technicians from around the U.S. will travel to Boston for the National Apartment Association’s 2012 Maintenance Mania® at July’s Education Conference and Exhibition. Maintenance Mania is a national competition where maintenance technicians compete against each other in skill-based games devised from common maintenance activities around apartment complexes. Contestants compete for the fastest repair or installation times in eight events, ranging from changing out heating elements on range tops to installing a ceiling fan. And these guys are fast. Last year’s champion, Jose Torreblanca of Van Rooy Properties and the Indiana Apartment Association, took the $7,000 grand prize with a combined time of 1:57.2 minutes, beating his nearest competitor by a mere second before 600 spectators in Las Vegas. Usain Bolt may be the world record holder in the 100 meter dash with a time of 9.58 seconds, but Enrique Alacron of Van Rooy Properties installed a fire and carbon monoxide safety set in 7.5 seconds. Who’s the “World’s Fastest Man” now, Mr. Bolt? NAA affiliates host Maintenance Mania events across the country to recognize maintenance technicians with awards, prizes, and bragging rights, and the winners can earn a spot in the finals. Qualifying for this year’s competition began in August 2011, with 60 scheduled venues, and runs through April. NAA began hosting the event in 2008 and more than 10,000 technicians have signed up since to compete for more than $20,000 in cash and prizes. Each year, 20 finalists are selected to receive free air fare, hotel accommodations, and registration to the NAA Education Conference & Exposition. The participant with the fastest combined time in each of the 10 NAA regions qualifies as a Regional Finalist. The Wild Card Finalists are then selected from the next 10 fastest times across all the regions. Participants do not need to be members of their local NAA affiliate to sign up, but must be employed by a member in order to qualify for the National Championship. NAA offers a helping hand to get contestants ready with training videos in eight challenges – toilet repair, appliance repair, fire and carbon monoxide safety installation, deadbolt test, faucet repair, lamp and ballast retrofit and ceiling fan installation. One video shows how to install a Fluidmaster Dual Flush system in 34 seconds. (Incidentally, Torreblanca got that job done is 22 seconds). 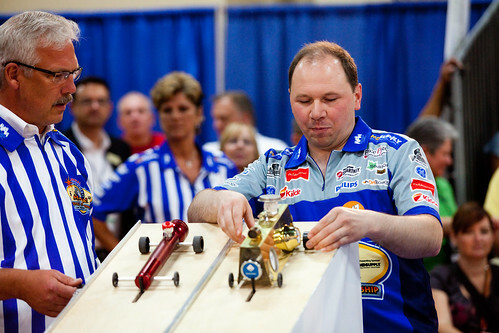 The competition also includes a pinewood derby style car race, but don’t expect to find parts for these unique cars at the local hobby shop. Cars must be made of tools and plumbing, lighting, electrical, hardware, or kitchen and bath maintenance supplies. Wheels are supplied, and the rest is left up to the Mario Andretti of maintenance. Maintenance Mania is a great way to keep a property’s staff agile and ready to make quick, effective repairs. And property managers should encourage maintenance staff to be frugal about what gets tossed out while doing a day’s routine maintenance around the complex. That bathtub faucet makes a nice, shiny body for that race car. Have you attended Maintenance Mania before? What about members of your maintenance staff? Share your stories below. This is awesome – can’t wait! It’s such a great way to celebrate and acknowledge maintenance professionals. Personally, I would love to see this live one day.